Audio of scripture reading, Ruth 1:1-18, followed by the sermon begins at 21:47. Before I continue with the reading, I want to take a moment to unpack what has already happened in just these 5 verses. It is a story filled with great tragedy, beginning with a famine. Elimelech, Naomi, and their two sons are forced to move from their home in Bethlehem to an entirely different country. I’m guessing they don’t want to move, to leave all that is familiar to them, but they likely will die if they do not find somewhere else to live. They end up in Moab, which is not a country friendly to the Judean people. In fact, when Moab is mentioned in the Hebrew Bible, it is usually associated either with shame or with hostility. Moab would definitely not be a place someone from Bethlehem would want to live. But, Elimelech and his family are desperate, so it is to Moab they go. Unfortunately, after arriving in Moab, Elimelech dies. But, even in the midst of grief there is some good news. Naomi and her sons seem to settle well in Moab, and each of her sons even marries a Moabite woman. Life is taking a turn for the better. But then, 10 years later, both of Naomi’s sons die. Though we certainly don’t know Naomi’s specific grief, we have all experienced the death of a loved one, and we all have known grief. Today is All Saints Sunday, which is an opportunity for us to remember those saints who have come before us, and to celebrate the wisdom and love they brought to our lives. And it is also a time to grieve, to acknowledge the fact that when someone important to us dies, it leaves a hole in our lives that will never be filled. This past week, I have especially been thinking about the Westminster members and friends who have died this past year. Knowing each one of them made a difference in my life, and I miss them. I want to read their names this morning, so we can remember, celebrate their lives, and grieve their deaths together. Olive Cook, Cena Bessolo, David Pittle, Louis Smith, Maria Styk, Jennie Hoffman, Carl Atkinson, Jim Hampton. We remember and give thanks for the lives of these saints. Author Joan Chittister says, “Saints give us a glimpse of the face of God in the center of the human. Saints give us a taste of the possibilities of greatness in ourselves.” It seems to me that one of the best ways we have to honor the saints who have come before is by continuing to share the love and light of God that they shared with us … to share the face of God that is in our center. As this story from the book of Ruth continues, we see examples of what this might look like. 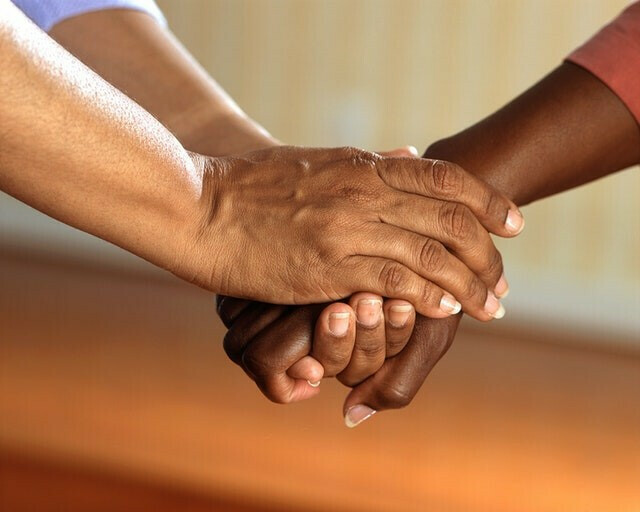 Naomi and her daughters-in-law, Orpah and Ruth, each in their own way offer loving care to one another in the midst of their grief. Rather than reading the scripture verses verbatim, I’m going to share the story from the perspective of Naomi. “So there we were. Three widows alone. But then there came good news from my homeland. The Lord had visited my land with bounty, there was rain again, the famine had ended. I knew I needed to go back home. When I told Orpah and Ruth, they said they would go back with me. When I put it that way, they didn’t seem to know whether to laugh or cry. But then Orpah did cry and said I was right. She said she would miss me, but she would go home to her family. I said I would miss her too, and she left. Naomi and Ruth, women from two entirely different backgrounds, different countries, different families, different traditions, coming together in love to support each other in their time of grief. As Ruth offers these beautiful promises to Naomi, we see the face of God in her center. We, like Ruth and Naomi, have a choice to make in difficult times – whether it be times of grief, or anger, or anxiety, or fear – do we allow the difficult times to separate us, or do we find a way to come together in love? Do we find a way to show each other the face of God at our center? How might we learn from Ruth’s example, and find a way to say to each other – I’m with you? I shared some of this story from Naomi’s perspective. Because it’s such a good story, I’d like to share it again, this time from Ruth and Naomi. When we say “I’m with you” to someone else, it means nothing unless we back it up with action. Ruth moved from her homeland – away from her family and all that was familiar – to be with Naomi. Not only did she move away from the familiar, but she moved to a country that was openly hostile to her and her Moabite people. But she did it. And through the love and care that she showed to Naomi, they both encountered the grace of God. May we do the same. Amen.